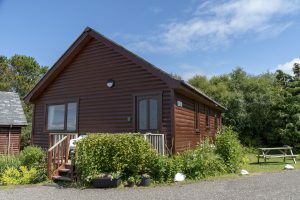 Our 3 holiday lodges are of traditional design and can sleep up to 5 persons. 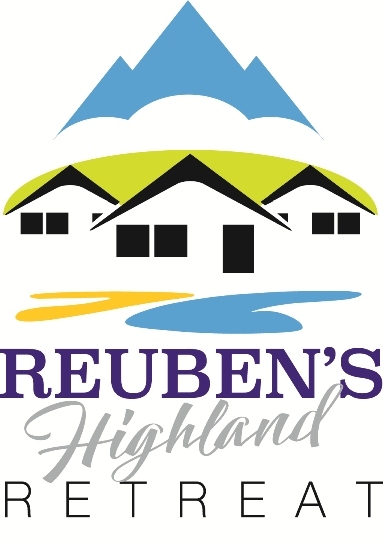 They offer a great base from which to see the local area and come fully equipped with everything you will need for your stay. Each lodge is at a different stage in its respective refurbishment programme so please see the descriptions below and check out the picture gallery for more details. All bed linen and towels are provided, there is a Freeview TV and Xbox games console in each lodge, and every lodge has its own wifi network. This lodge sleeps 5 people in two bedrooms. The main bedroom has a double bed with the second bedroom having bunk beds and a single bed. There is lots of storage in both rooms with a wardrobe in each as well as drawer units. The bathroom has a bath with an electric shower and there is a wall mounted down-flow heater providing instant warmth for the colder periods. The open plan kitchen and living area has been tastefully decorated with a Scottish twist and some quirky design features. Star Wars fans will love the lightsabers, ships, figures and memorabilia which adorn the walls! With a newly fitted kitchen this lodge has a luxurious feel to it. Lomond is identical to Ness in terms of layout sleeping 5 people in two bedrooms. It has the same specifications as Lodge Loch Ness but instead of Star Wars this lodge has a Harry Potter theme! Look out for broomsticks, the Marauders Map, a talking Doby and even a copy of Harry’s acceptance letter to Hogwarts! A new kitchen has been fitted for the 2019 season. 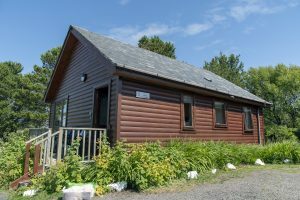 This is our pet friendly lodge for the budget conscious traveller. It can accommodate 4 people in two rooms, one with a double bed, and bunk beds in the second bedroom. 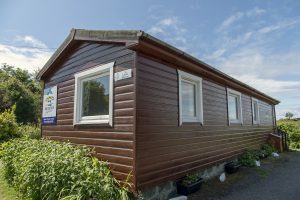 Morar has the best view of all 3 lodges with an uninterrupted outlook across to Skye. We’ve just fitted a new kitchen with dishwasher which is open to the lounge area over a large breakfast bar.